Having arrived at Barcelona for a club-record fee from Liverpool in January 2018, Philippe Coutinho’s future at Camp Nou is uncertain. 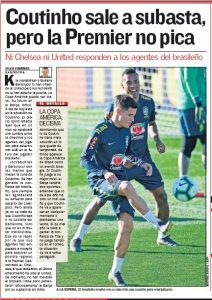 On Friday, Marca reported the La Liga winners are ready to sanction the Brazil international’s sale and Manchester United was reported as one of the possible destinations, with whom contact have already been initiated. Saturday’s edition of Spanish newspaper AS provides more information regarding the efforts made by the former Inter Milan’s representatives Kia Joorabchian and Giuliano Bertolucci to find a new destination for the South American. It’s claimed the 26-year-old is no longer a star or undisputed starter at the Catalan club, which is why his agents have tried to explore the possibility of the midfielder returning to the Premier League. Chelsea have ruled out the possibility of signing Coutinho and after that, the player’s agents offered their client to Manchester United. AS claims the Red Devils have so far ‘not taken the bait’ and have not responded to the representatives. The Old Trafford club have ‘not opened the door’ for the potential transfer. Joorabchian and Coutinho will have to find another club soon, if he is no longer required at Barcelona.